Just a warning. I have been baking much more than cooking these days. Sometimes it just works out that way. Between parties I have cooked for, nights out, nights alone with the boys, classes, recipe testing, and all the other things that make up our busy lives, there hasn’t been a lot of dinner cooked here in the Dana Treat household. I know some of you visit here for the treats – you’ll be getting plenty. Those of you who visit for healthy fare, I’ll do my best to throw some things your way too. If nothing else this week, I have salad for you. I wondered whether to post this. It is not rocket science and do I need to share a recipe that you have probably made on your own? But then I made it for friends and it got devoured as it always does. Every time. I realized that, having made about a million Green salads over the years, I have learned a couple of things and it is the tips that I want to share with you as much as the recipe. You can make the recipe your own, obviously, but here are the tips. Tomatoes – Use cherry tomatoes unless it is summer and you live in a state where that means tomato season. (I’m looking at you New Jersey.) We get a brand of cherry tomatoes here in Seattle called Nature Sweet Cherubs. I find those to be reliably pretty good. Taste your tomatoes and if they aren’t great, put them on a baking sheet with a drizzle of oil and a pinch each of kosher salt and pepper. Roast at 400º for about 20 minutes and allow to cool. The texture will be different than a traditional Greek salad but at least the tomatoes will taste good. Cucumber – Use an English, sometimes called “seedless” cucumber. I find these to be sweeter, less watery, and best of all – you don’t have to peel them. I love the color and flavor that the peel brings. If you can only find regular old cukes, do peel them and seed them, otherwise you will have tough skin and a watery salad. Olives – Someone once told me that olives that have been pitted for you have less flavor than the ones that still have their pit. I am here to tell you it is true. I keep a jar of pitted olives on hand for recipes where a tiny dip in flavor won’t be noticed but for this salad, you want the best. Many grocery stores have an olive bar these days and that is where I look for mine. Use something nice and plump – it doesn’t have to be Kalamata. To pit an olive, use the flat side of a large chef’s knife to press down on it and then simply peel the flesh away from the pit with your fingers. Feta Cheese – Please do not use something that comes in a tub. Those types of feta cheese taste like sawdust to me. I can always find Mt. Vikos feta cheese at my grocery store and I really like the flavor and texture. If you have a Greek or Mediterranean market near you, or a great cheesemonger, ask for the best. It does make a difference. Finally, cut the cheese (sorry) into small cubes. I find if you crumble it in, it tends to turn the whole salad white. Also, I prefer not to have cheese with every bite. With cubes, you can pick and choose. 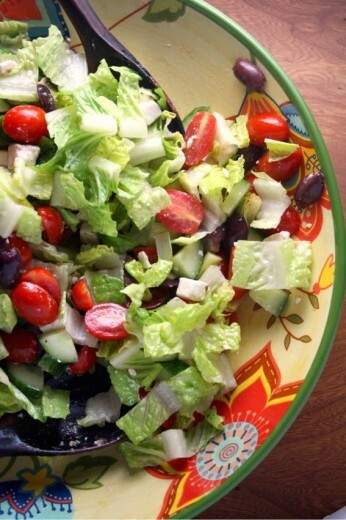 Oil and Vinegar – This salad does not need a dressing. Use a drizzle of your best olive oil and another drizzle of red wine vinegar. I used to use balsamic vinegar but now I think the sweetness is not welcome here and it also colors the salad an unattractive shade of brown. Sometimes I make this without the lettuce but when I need to bulk it up a bit, I use the romaine. Truthfully, I like it better this way. 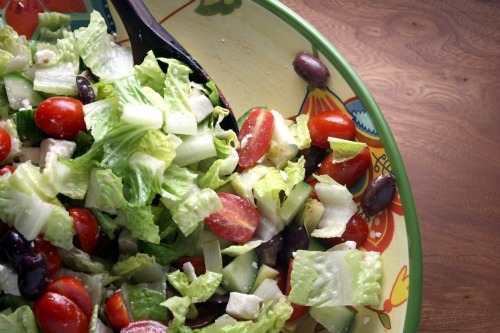 Place the tomatoes, cucumber, olives and lettuce in a large salad bowl. Drizzle with approximately equal amounts of olive oil and red wine vinegar. Toss well. Add the cheese and very carefully, trying not to break up the cheese too much, toss again. I’ve never heard of peeling cucumbers, we don’t really do that here. We must get good cucumbers that don’t need peeling. Sounds like a good salad to me and I absolutely love that bowl! It’s amazing how many people need tutorials on how to make a good salad (cough mom) so this is definitely appreciated! I rarely make green salads other than for company…and I’m ashamed to say I used to use pre-crumbled feta…but never again! I recently spent two days making two dozen filled, gluten free cupcakes and a six layer, heavily frosted lemon layer cake. I’ve been *dreaming* cake. Normally I’m all about the treats, but right now I just want salad. 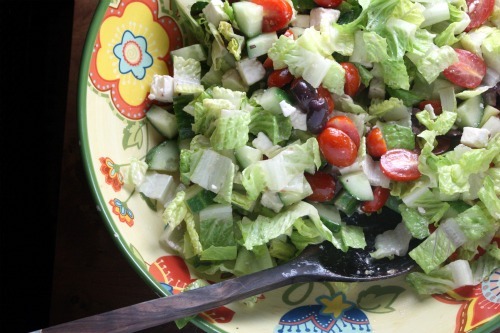 My Greek salads have traditionally fallen flat, so I can’t wait to try this! Oh Greek salad, how do I love thee? Let me count the ways. I like to balance the zing of the olives with the pow of a spicy, twangy pepperocini. Those are some useful tips. Points taken. Thanks for sharing. It may not be rocket science but when the ingredients are the best they can be it makes for one outstanding salad. When I was in Greece I had it almost every day! Love your extra hints. I’ve always wondered about the pre-pitted olives and brand of feta. Can’t wait to put it all together. Aha. I said goof. Ahem. I don’t know what you mean by English cucumbers. Our two main cucumber varieties are “continental” and Lebanese. Lebanese cucumbers are smaller and thin skinned.